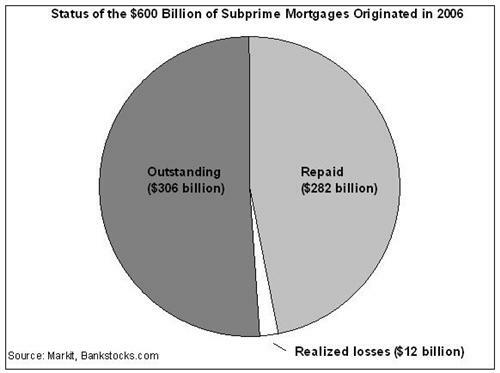 Here’s a question for the subprime mortgage geeks in the house: which is bigger, the dollar amount of realized losses on 2006-vintage subprime mortgages, or the dollar amount of loans that have been repaid? Take your time; I’ll get to the answer in a minute. The reason I ask in the first place, though, is that the question is a good first step in getting at a reasonable estimate of how high cumulative losses from the subprime mortgage debacle will ultimately be. That happens to be a number, you’ll agree, an awful lot of people on Wall Street are interested in knowing. Yet estimates are all over the place. For its part, Moody’s says its best guess for eventual 2006-vintage losses is between 14% and 18% of originations. Its “stress case” is more like 21%. Some of the more hysterical numbers I’ve read put the eventual cumulative loss at 80% or more. It’s hard to not get the impression that people are using all kinds of methods to estimate, some sensible and some not, while others are simply sticking their fingers in the air. But I believe it is possible at this point to get to a reasonably accurate cumulative loss estimate. How? By looking at the credit performance of the $120 billion of bonds that make up the ABX subprime mortgage indices (in particular, by looking at the bonds that underlie the ABX indices created in 2006, when the lending looniness was at its peak) and extrapolating to the market at large. On the one hand, the bonds were hand-picked to represent the market overall; they should behave the same way the market does. On the other, they constitute a small enough universe that an analyst trying to glean future credit performance can take into account details such as loan-to-value ratios and loan originator. So we’ve gone through 2006-vinatge ABX bonds in a fair amount of detail to arrive at an eventual cumulative loss estimate. And (not to give away the ending completely) the number is materially lower than the base cases the agencies have in mind, and much, much lower than the apocalyptic predictions you keep hearing on CNBC. I’ll get to the details in a second. But first, the answer to my question: which is bigger, realized losses or paydowns on the class of 2006? It’s not even close. Of the $600 billion or so of subprime mortgages originated in 2006 (again, by the lights of what have gone on with ABX bonds), $282 billion have already been repaid, while realized losses have come to just . . . $12 billion. Surprised? Understandable. That’s not to say, of course, that that $12 billion of realized losses to date isn’t destined to balloon to a much bigger number, and that the ultimate losses on the 2006 vintage won’t be many times higher than the subprime losses of prior years. Of course they will. It does, though, give some perspective on how to most accurately predict what the future will bring. Anyway, allow me to walk you through how I came up with a loss number I believe will turn out to be reasonably accurate, and not especially scary. We’ll start at the beginning. First, take the $600 billion in subprime loans originated in 2006 and put them into three imaginary piles: 1) loans that have been paid down, 2) loans that have already resulted in losses, and 3) balances still outstanding. OK? We already know what the losses are on 1 and 2. They are, respectively, $0 and (as I’ve already mentioned) $12 billion. So the question as to ultimate losses on the 2006 vintage comes down to what happens to 3, the $306 billion in balances outstanding. And actually, we have a pretty good idea what will happen to a big portion of those loans, as well. Of the $306 billion, $100 billion is delinquent by 60 days or more. As any subprime-mortgage banker will tell you, once a loan gets past 60 days past due it’s pretty much doomed these days. So we’ll assume that fully 93% of those delinquent loans go into foreclosure (a much higher rate than is typical, but hardly uncommon recently) and generate a loss severity of 45% (compared to last year's rate of 35%). 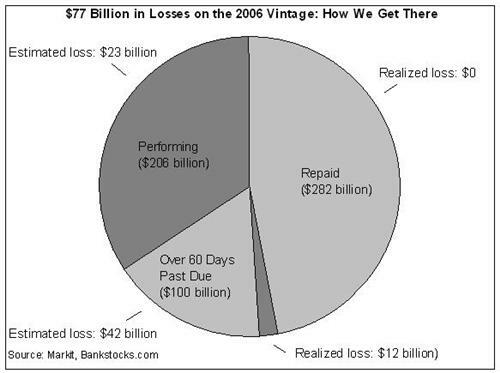 Estimated losses from past-due 2006 outstanding balances, therefore: $42 billion. That leaves the $206 billion of outstanding balances that are still performing. Obviously, some of those are destined to default, as well. The question that has the financial markets transfixed is: how many? To get an answer, I looked at which lenders originated the remaining performing loans, where the properties are located, and other relevant factors, and extrapolated past performance into the future. I came up with an estimate that 26% of remaining loans now current will eventually default, which will in turn lead to (again, assuming a 93% roll rate into repossession and 45% severity) $23 billion in losses. The other, 74% of the remaining outstanding balances will sooner or later pay down. The losses from those loans will of course be zero. Estimated losses on outstanding balances still current: $23 billion. Add those three numbers up, and you get $77 billion in cumulative realized losses on the 2006 vintage. Divide it by originations and you come to a loss rate of . . . .
Actually, before I get to that number, let’s go back and revisit the loss estimates the rating agencies and the bears have in mind. Moody’s base case for 2006 losses, recall, is between 14% and 18%. Its stress case is 21%. Fitch’s stress case is 21%, as well, while S&P’s is 18.8%. The Charlie Gasparino/Bill Ackman/George Soros Axis of Doom, meanwhile, surely has a number in mind that is much, much higher. But, as we’ve seen, if you actually go through the numbers trust by trust, look at what’s happened so far, and make some conservative assumptions about what will happen in the future, you get to estimated total losses of $77 billion. Divide that by the $600 billion in 2006 originations and you get to a total loss rate of just 12.8%. That’s well short of Moody’s base case, and nowhere near the stress cases that the agencies have put out. You might object to some of my numbers here. Fine, but you can only object to a few of them. You can’t dispute, for example, that nearly half of the subprime class of 2006 has already been paid down, for instance, or that, of the remaining balances, roughly two-thirds are still performing. Those are simply facts. You might, on the other hand, argue that my 45% severity assumption is too low, or that more than 93% of 60-plus-day delinquent loans will eventually roll into foreclosure. In fact, that’s what Zach did. But even if you assume delinquency roll rates that are even more severe than the elevated numbers I'm using, as he did, you still only come up with an ultimate loss rate of just shy of 16%. As far as that goes, UBS, the only firm on the sell-side that’s analyzed the credit performance of the ABX bond by bond, uses loss estimate embedded in the price of the ABX itself and comes to an estimate of 18%. It’s notable, I believe, that all these numbers, even the ones based on hyper-severe assumptions, aren’t terribly different from one another. And it’s even more notable that they’re all well short of the agencies’ base cases, let alone their stress cases. Or let’s turn things around. How bad would things have to get for the Moody’s base case to actually happen? Unbelievably bad—literally. The 16% midpoint of Moody’s base case translates into $96 billion in eventual losses. Twelve billion dollars has already happened. Fine. But, as we’ve seen, $282 billion of the $600 billion in 2006 originations has already been paid down. Those loans won’t default. Of the $306 billion that’s still outstanding, $100 billion is seriously delinquent. We have a good idea of what’s in store for those loans; they’ll likely generate another $42 billion in losses. That still leaves us $42 billion short of the $96 billion needed to get to a 16% loss. By definition, it can only come from the $206 billion in remaining, performing loans. If you assume 50% severity, that means that of the remaining performing loans—the strongest horses in the field so far—fully 41% would have to default. And that’s just to get to the base case. To get to the agencies’ stress cases of a 21% cumulative loss, 71%--yes, that number starts with a “7”--of the remaining performing loans would have to go bad. I don’t buy it. I don’t buy it, in particular, because at the margin the news from the subprime mortgage credit front seems to be improving. The rate of loans moving from current to 30-days delinquent has slowed over the past few months. And the rates at which delinquent loans are rolling into later-stage buckets seems to have stabilized. It’s as if—can you believe it?—things have finally stopped getting worse. That’s something else you won’t be hearing on CNBC anytime soon. 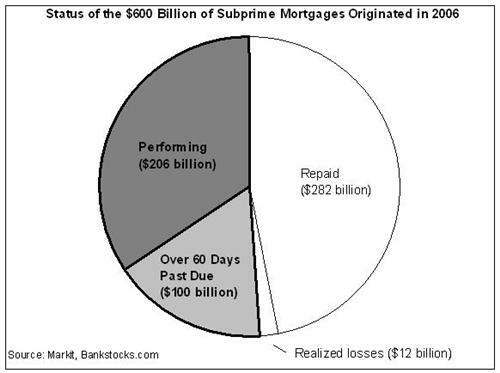 For months now, investors’ default habit has been to assume the worst regarding subprime mortgage credit. It’s been the profitable habit, too. But this whole time, people seem not to have noticed that a lot of subprime borrowers have paid down their loans completely, and that most others are still current. Guess what? That will keep on happening. And as it does, the subprime mortgage crackup will at last come to an end. In the end, I suspect, the wild-eyed losses being thrown around by the bears will turn out to be way, way off the mark. Don’t take my word for it. Just look what’s happened to the 2006 vintage so far. Tom Brown is head of BankStocks.com.